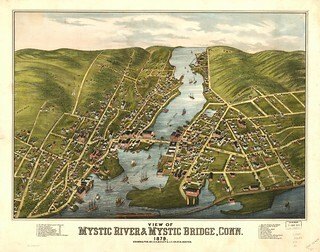 View of Mystic River & Mystic Bridge, Conn. 1879. Author: Bailey, O. H. (Oakley Hoopes) & Hazen, J. C.
Title: View of Mystic River & Mystic Bridge, Conn. 1879. Publisher: Bailey & Hazen, Boston . Col. map 46 x 65 cm. Notes: Perspective map not drawn to scale. Hand colored. Bird's-eye-view. Indexed for points of interest. References: LC Panoramic maps (2nd ed. ), 85.3. Reproduced from the original map in the Geography and Map Division, Library of Congress. Please contact the Division for copy rights.